Of late, Chinese brands and manufacturers have managed to garner a lot of interest in the Indian market, thanks to the great value for money they have to offer. The latest entrant is the Oppo Find 5, which comes from a Chinese phone maker called Oppo, known for Blu Ray players in the USA and other parts of the world. The Oppo Find 5 is now available to Indian buyers via the AndroidGuruz chain, a retail franchise which will be selling phones across 40+ brands from China. 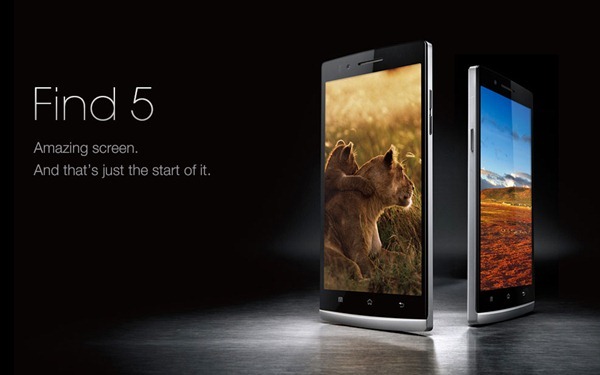 We had first reported last month, that the Oppo Find 5 will be coming to India. The Oppo Find 5 will be available in two variants, the 16GB white & the 32GB midnight black version, priced at 27,445 INR and 31,259 INR respectively. The difference in the devices will be the colours, and the available ROM, and everything apart from that will be the same. The Oppo Find 5 features a 5 inch touch screen with a superb full HD resolution of 1920×1080 pixels, and a PPI of 441. It will be powered by a Snapdragon APQ8064 processor, clocked at 1.5GHz, and the extremely powerful Adreno 320 GPU. This is not all, the phone comes with 2GB of RAM, and support for NFC – Near Field Communication. The OS will be Android 4.1 Jelly Bean – but with Oppo’s customized skin on top. Other features of this powerful device include 13MP rear camera, 1.9MP front camera, Dirac Audio, a 2500mAh battery (non-removable), Proximity, Gravity, Gyro sensors, WiFi, Bluetooth, and support for DLNA (Digital Living Network Alliance). Until now, buyers in India had to import the device from overseas – but the process is now streamlined and buyers can avail this device without having to worry about shipping and customs, thanks to AndroidGuruz. These specifications mean that the device is pitted against the likes of HTC One and Sony Xperia Z, which are both flagships of mainstream brands. However, the Oppo was launched much before these two and is the clear winner in terms of time at least. The Oppo Find 5 is cheaper than both, the One and Xperia Z, and all the 3 devices have almost identical specifications, with all three having quad core processors and 2GB of RAM. The Xperia Z and the Find 5 have 5 inch 1080p screens, while the HTC One has a smaller 4.7 inch display, but that is in full HD too. There is nothing much to choose from between these 3 devices, it would depend on the buyer totally. People who like to experiment might want to go for the Oppo Find 5, while those looking for a robust device can choose the Xperia Z. The HTC One comes with a smaller screen, so it might fit people who don’t like big screens. The Oppo Find 5 can be bought at AndroidGuruz.